I received a package in the mail today from my friend and fellow blogger Laura from Violet Bella. Inside was an absolutely gorgeous necklace she had made me. 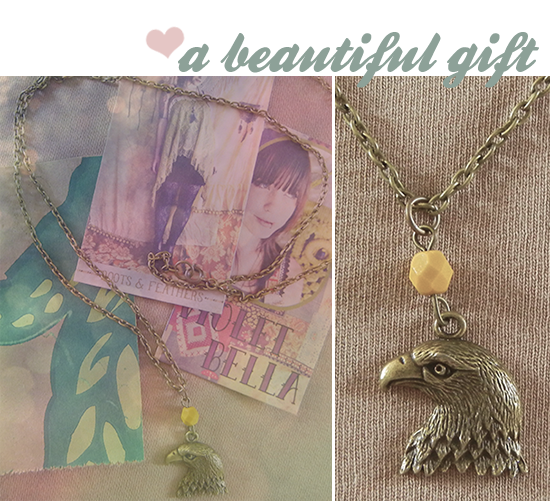 The necklace is stunning in itself, with an eagle charm and a pretty mustard yellow bead on a long brass chain, but it's the meaning behind the charm that makes it so special. Laura is someone I met through the blogging community, under bittersweet circumstances. We'd both been through a similar tragedy, and were able to connect through our conversations about our experiences. She is a beautiful person inside and out, and I feel lucky to know her. She is also multi-talented, and her creations are really amazing. You can see for yourself in her shops, Violet Bella and Roots and Feathers. Thank you so much Laura for this sweet surprise. It came at the perfect time. Tomorrow = GIVEAWAY! Be sure to stop by tomorrow morning. This one's a good one. melissa, im honored to have met you, even though it was through such bittersweet circumstances. the way you opened up to me, and allowed me to really feel myself openly was and is amazing, and this was just a tiny way i could say thank you. your a gem. and i barely know you! xo. Sorry to hear how you know each other but so glad you do. melissa , i checked out laura's blog, it's lovely! her etsy shop is full of mini works of art.